Enclave, an inner-city residential community located in Melbourne’s Ascot Vale. “This represents a unique opportunity for purchasers looking for the right place to buy into Melbourne’s inner-north west. We’re thrilled to be partnering with Gresham to deliver this project, with the objective of providing positive community outcomes for existing and future residents,” says Mirvac CEO Residential, John Carfi. The project, delivered as a joint venture partnership between Mirvac and Gresham Property Fund No. 3 (Gresham), sold 95% on launch. 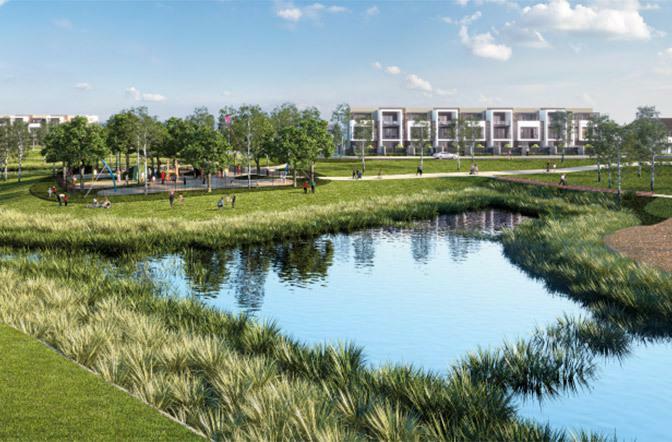 Enclave is located 7km from Melbourne’s CBD and comprises in excess of 200 dwellings on 10.423 hectares, including a mix of land allotments and Mirvac-designed homes. Home and land packages are priced from $549,000. It forms the third stage in the Ascot Chase project and is located directly to the north of stages 1 and 2, which has been delivered by Urbex and Gresham. Enclave will focus on improved affordability to homebuyers through offering a range of land and town houses. Buyers have the option of choosing a 6+ Star Energy Rating Mirvac-design, with two or three bedroom double storey homes and spacious three level, four bedroom homes. Purchasers also have the option to build their own home by selecting a block and a builder of their choice. 10m wide frontage blocks and 12.5m wide frontage blocks are available. The residential community is set to draw in young couples and families alike due to its close proximity to Melbourne’s CBD, which is easily accessible via ample public transport, and its setting amongst parkland, Flemington Racecourse and retail services on Union Road and Puckle Street. A wetlands reserve with a playground will be a central feature and will provide a link to the nearby Walter Reserve and the Maribyrnong Regional Parklands.